Europe's fetish for staging traditional, staid opera in modern, Metropolis hubs -- like offstage productions of Bohème in Hochhaus Bern and Traviata in Hauptbahnhof Zürich -- makes for alluring metaphor: both opera and transportation stations are gateways to aspirational travel, whether it be through the librettist's transcendent quill or a commuter's escapist fantasies. We've indulged in both. Tonight, opera goes offsite again for the Salzburger Festspiele's staging of Mozart's Die Entführung under twelve-hundred tons of steel and 380 tons of curved glass at Salzburg Airport's Hangar 7. The backdrop will span ten public spaces, including the hangar's collection of historic airplanes (like a WWII-era P-38 Lightning) collected by historic aircraft enthusiasts The Flying Bulls. Director Adrian Marthaler, who previously collaborated with the Hauptbahnhof Zürich Traviata, updates 18th century Turkey and the sultan's harem to a modern-day fashion house complete with catwalks, seamstress workshops and photoshoot sets inhabited by photographers, models and stylists. Pasha Selim (orated by Tobias Moretti) is a fashion house designer, Blonde (Rebecca Nelsen) is a makeup artist/stylist and 'Stanze (Desirée Rancatore) is a bourgeois girl seduced by the glitter of the jet-set lifestyle. Dressed by Viennese fashion designer Lena Hoschek's costumes and tracked by 16 cameras and 200 technical staff, Die Entführung will be filmed live and streamed at 20.15 GMT+1. A portentous theme in the run-up to the September fashion shows, fashion pirates will give our predictable Milan Fashion Week stress nightmares a whole new level of terror! A few impressions off the top of Opera Chic's tired head because she just got back from Turin where earlier tonight she witnessed the Turin premiere of the Nicolas Joel production of Offenbach's Les Contes d'Hoffmann (a Turin/Toulouse/Madrid/Tel Aviv co-production). First things first: Opera Chic would like to thank, as everybody else in the audience tonight should, Simone Alberghini: despite having sung last night at the second cast's general rehearsals and being scheduled to sing tomorrow, Alberghini tonight replaced an indisposed member of the first cast -- thus committing himself to sing for three nights in a row his different parts (Lindorf, Coppélius, Docteur Miracle and Dapertutto). So, big hugs and cheers and teddy bears to Alberghini: without him, we would have been Offenbach-less for the night. Tomorrow in the full review we'll discuss the production -- with a steampunk touch that OC found endearing, despite her doubts about many choices by the director), the conductor Emmanuel Villaume, a tall order of French coolness waving some impressive windmill-like arms who shaped very boldly and beautifully Act I, coaxing lightness and beautiful clarity from the Regio's orchestra to shift later to darker hues. The talented cast -- among them Monica Bacelli and Nino Surguladze -- was one of the reasons we traveled up to Turin on a freezing, scarily foggy bleak Northern Italian midwinter night. But we need to make clear that the longest ovation, by far, and the warmest applause at curtain call, was won by the young woman -- who just turned 32, auguri! -- who became Olympia, opera's favorite automaton, under our watchful eyes. Desirée Rancatore, coloratura soprano of wonders, has already emerged as one of the (very few, there's Dessay and frankly very few others) leading Olympias worldwide. And tonight she brought the haus down with her humor, her sweetness, the unabashed power of that voice, and the fearlessness she showed in attacking the trickiest passages -- a highwire act delivered with coquettish smiles, sweet rubbery moves, and her special way of blinking robotically with a very human twinkle in her eyes. It's probably not physically possible to perform the scene twice in a row; but when it's over, you wish you could Tivo Rancatore back on stage -- the rest of the opera can wait -- and see and hear her all over again. There are not many artists you really really want to rewind, as you're cheering happily at the end of an aria. It's a small sorority of singers -- and a fraternity, too -- with elite members, who can usually achieve that magic only in their (few) trademark roles. But Rancatore as Olympia is like that -- she projects that light. She's like a rainbow. Diehard Fans Demand More: Juan Diego Flórez's Ill Skills. *Enter the Wu-Tang/36 Chambers: "Da Mystery of Chessboxin". Decked-out in a Pringle black cashmere dress (with a silk frill top and severely pleated skirt), I threw one of my Burberry trenches over, and made my triumphant return to La Scala. Without a scarf (in Milan = scandalous), I skipped down to the theater in black stockings from Kristina T and Boule de neige black pumps; Like a sweaty blind-date, Donizetti's La Fille du Régiment at Teatro alla Scala was waiting. But to disclose before I begin: Opera Chic was seated in a *very* conspicuous, open area, which made it a ginormous challenge to capture media for her lovely readers. But like a t-shirt ninja, I dug-in and infiltrated…because I ♥ you guys! Soprano Désirée Rancatore was vocally stunning, and sang deftly. She played Marie's surly defiance well with her brash mannerisms and equally piquant voice. Dressed in garish costumes throughout the performance, she somehow was able to wield her petit frame proficiently. She however did flub at least three recitatives during Act I, omitting a few words, which were accompanied by a few titters from the audience. With her overall heaviness, she succeeded in making Flórez appear to float at least a few inches above the stage. I freely admit that if Natalie Dessay had not cancelled her commitment for Marie in December 2006, this performance really would have been something quite spectacular. Dessay's graceful, ballerina idiosyncrasies simply would have been better suited against lighter-than-air Flórez. Onto Juan Diego Flórez: his Tonio was superbly placed, but then again, I've never been disappointed. Since my days at the MET witnessing the lamby-throated tenor in a bevy of performances, he continues to charm the audience with his charismatic smile and graceful elegance. He flitted around the stage during Act I in a red vest, green knickers, and white tights. And his hair is a bit bigger than his L'italiana in Algeri days at the NYC MET. About that bis: The applause after A mes amis was about four or five minutes, with Flórez bowing deeply and solemnly the entire time. It was Le Caporal et Choeur who began the foot-stomping on stage (the traditional call for bis), which never really spread to the audience lol. But we all knew what was inevitable, and cheered regardless the perfection of this stellar tenore di grazia. Flórez was, after all, quite deserving of the endless cheers. Bis! Bravo! Viva il Flórez! Yves Abel picked-up the orchestra, and the tenor took A mes amis from an abbreviated point. He effortlessly nailed the 9+9 high Cs, leaving the audience breathless. His slang is mad dangerous…more deadly than the stroke of an axe, choppin’ through ya back *swish*…givin’ bystanders heart-attacks. (Wu-tang represent). Opera Chic is thrilled to be part of this operatic history that was captured last night, but can't really quantify my sentiments...because we are talking about JDF here, and the half-lamb/half-prince can do no wrong in my eyes. If it was another tenor who called for the bis, I probably would have regarded it as a tacky, desperate attempt at show-boating. I can definitely see how Toscanini banned the aria bis, and branded it as a clumsy interruption of the artistic adhesion of an opera. But Flórez could make drying paint appealing. He could have wheeled-out his accountant and sorted through his taxes right there on stage, and I would be rapt with attention. Anyway, the rest of the cast was lovely: Francesca Franci's La Marquise de Berkenfield was strong, entrancing, and entertaining. Anna Proclemer's La Duchesse de Crakentorp was almost mythical. Alessandro Corbelli's Sulpice was lovely, and great fun with his “rataplan”. 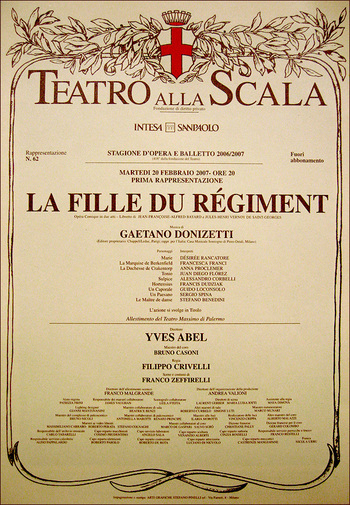 By the middle of Act II, the audience started demanding additional bis from like everyone and their mother, and there was a definitive moment of sheer stupidity when deafening applause and shouts of bis was called for one of Désirée Rancatore's later arias (regardless of the fact that she was treated to a very lukewarm reception during Act I). The soprano rightly did not deliver. Frengo's garish, grating sets and costumes made the very subdued and elegant Opera Chic want to rend her eyes blind. Flamboyant pinks, yellows, and royal blue assaulted each outfit, and distracted from the wonderful singing. The scenery transpired as Victorian paper-cut-outs and comic-book inspired renderings that seemed almost demonic and twisted in contemporary times. Filippo Crivelli's beyond-old-skool direction hasn't been seen since that whiny, campy Bergonzi/Scotto 1952 L'Elisir d'Amore [well, it reminded me of that, although Crivelli wasn't culprit]. This production desperately is in need of a make-over. Of course, the Flórez 2005 live performance of Tonio at Teatro Carlo Felice springs to mind. And again, whereas Marie is supposed to steal the show, Flórez again upstages everyone, and becomes the very force that the opera revolves around.